At the first moment of cosmogenesis (the "Big Bang" as science sees it, the initial highest frequency/energy phase order (spiritual) triune fields of spacetime, fractally involve and descend in orderly frequency-energy phase orders, stepping down from near infinite frequency spectrum's to near zero after emanating from the *singularity* of general relativity, whose dual inherent qualities, at its zero-point center of origin (absolute space) are both, *potential* subjective consciousness and *potential* objective *matter*. 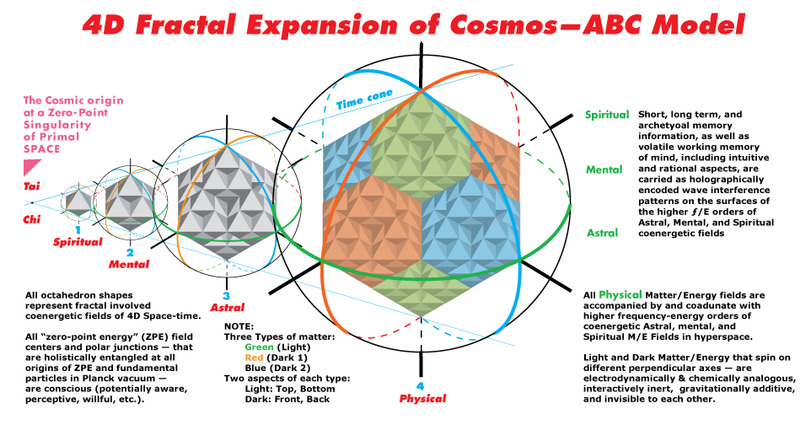 The following diagrams symbolize this initial fractal involution and expansion of cosmos. This source of everything in our physical-phenomenal hyperspace and metric space-time is the timeless and dimensionless zero-point center and surrounding infinite spin momentum (G-force or "spinergy*) of unconditioned and eternal Absolute SPACE. 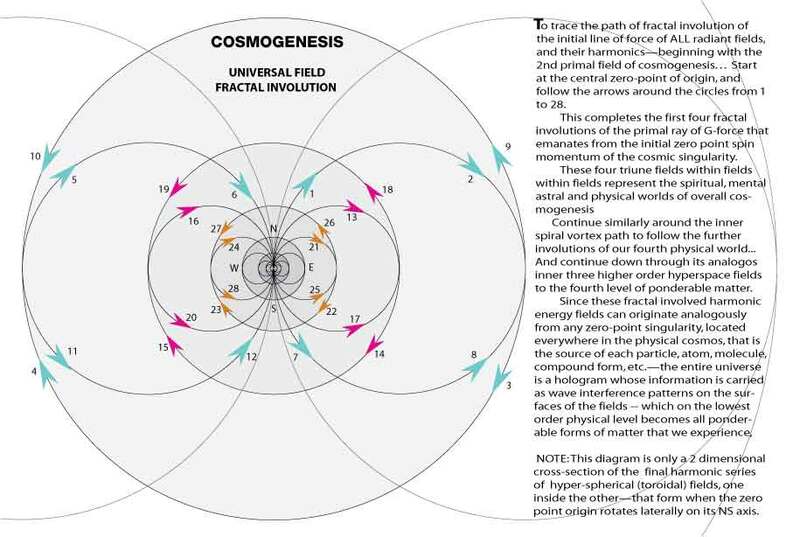 This primal space remains, ubiquitously, in our lower order physical/material spacetime, as the zero-point center of "spinergy" at the origin (singularity) of every radiant field, fundamental particle and physical form, up to the largest galaxy, quasar, black hole, etc. Einstein labeled this ubiquitous source of ZPE, "aether" or " total space." 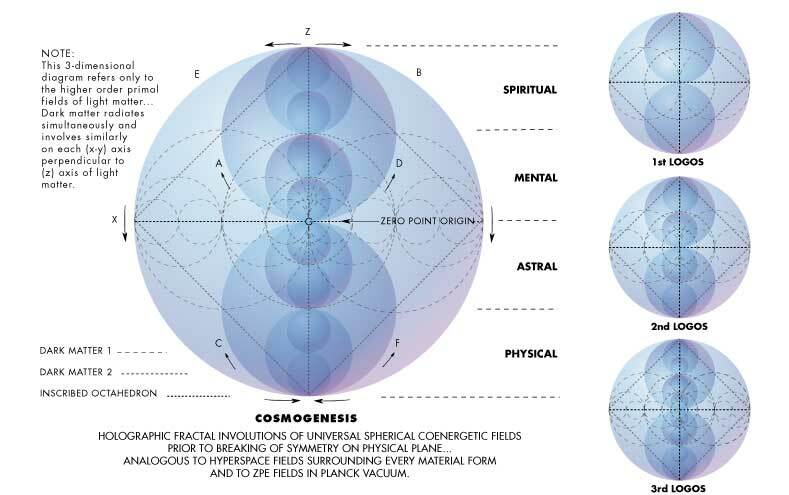 It is this Absolute SPACE that is both the creative force (conscious will) and the receptive womb (infinite spin momentum on triple perpendicular sets of infinite spherical axes) that constitutes the "cosmic eggs" out of which all subsequent universes, with their metaphysical hyperspace and physical metric space fields, fractally involve, and, after descending to the lowest order physical space (at the third fractal iteration, subsequently evolve, simply and directly (by natural selection, possibly guided by morphogenetic fields linked to fundamental consciousness along with stored memory of previous life forms) with our cosmos being only one of those infinite "parallel" universes with the same fundamental cyclic and electrodynamic laws, rooted in primal spin momentum, governing each of them. Thus, everything (including all multidimensional space-time fields and all matter-energy forms) throughout all spherically manifest SPACE-TIME universes are cyclic in nature and appear and disappear periodically, and their harmonic field involutions are essentially analogous and corresponding in accord with holographic principles and the universal laws of electrodynamics, all, based on the ubiquitous fractal topological geometry and the fundamental spin momentum of every-zero-point "singularity" throughout "total space" (including "hyperspace" of string theory and metric spacetime of general relativity ). Therefore, since consciousness is the fundamental quality of the zero-point center of spin momentum in absolute space, each such "singularity" is potentially conscious, as is every zero-point center of all fractal involved information/energy fields radiating from it, ad infinitum. Note that the central spiral vortex crossover point (analogous to all adjoining toroidal fractal involved fields) is what modern string and quantum physicists might call a "twistor" or a "wormhole" in our total physical spacetime. Note: Not shown here are the lines of force emanated in the opposite direction from the initial singularity. Nor are shown the fractal involutions of all spherical fields within each toroid's outer circles (as they generate their own inner fractal involved hyper-spheres due to lateral rotation on their zero-point centers). That infinite divisibility of absolute space is the basis of the holographic nature of all reality. This fundamental structure of spacetime, includes all zero-point fields radiated from the ZPE at the Planck level (that generates and empowers all the black hole centers of every galaxy, star, planet, organism, organ, cell, virus, down to each fundamental quantum and sub quantum particle (standing-wave) and all the electrodynamic radiant fields of metric space and hyperspace in our physical spacetime realm. All such information is also reflected in the EM fields of the brain whose malleable neural network serves as the material/physical/chemical link between the senses, neuromuscular system, and the mind and memory fields. The brain also is the CPU and controller of all the autonomic life support systems within the corporeal body. In itself, the brain is entirely unconscious -- except for the subliminal cellular awareness of their own individual conditions. 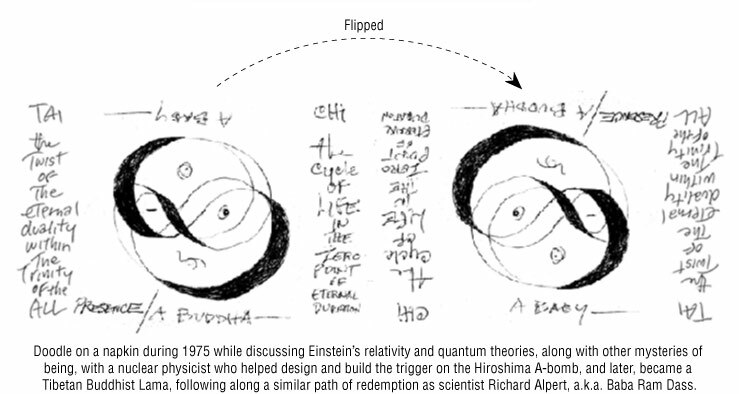 All such information of consciousness (either neurologically transformed sensory or stored memory field images) can be holographically reconstructed, detected and perceived as qualia, at each zero-point of awareness (at the field centers of origin) solely by reflection of appropriate higher order coherent radiation, projected willfully from the spin-momentum (spinergy) surrounding each point of sensory perception. This willful projection also is linked to the control of attention, which in the case of vision, automatically directs the saccades, convergence, and focus of the eyes in conjunction with the neural processing, hard wire-linked everywhere throughout the body, and the learned control of all intricate and subtle muscle movements at the level of "cell memory". This could also explain how a musician can play a practiced musical piece, once thoroughly learned, without any conscious thought or attention to the body or the instrument. Note that our appreciation of music and our emotional and physical response to it is also based on cellular memory, and may even go as deep as our DNA memory, as evidenced by music (harmonics, resonance, etc.) and rhythm (massage, acupuncture, acupressure, tapping, etc.) used as a medium of healing. Thus we see and hear from a point in the center of our head, feel pain at the point of trauma, taste on the tongue, smell in the nose, touch on the skin, etc, with all such zero-points pf awareness entangled with the central zero-point of our individual self or "I AM" consciousness located in the neural plexus at the naval chakra center of the overall body aura or spiritual field. This highest order field center is also linked to the respiratory system, and at another frequency-energy phase order, controls the heart beat. 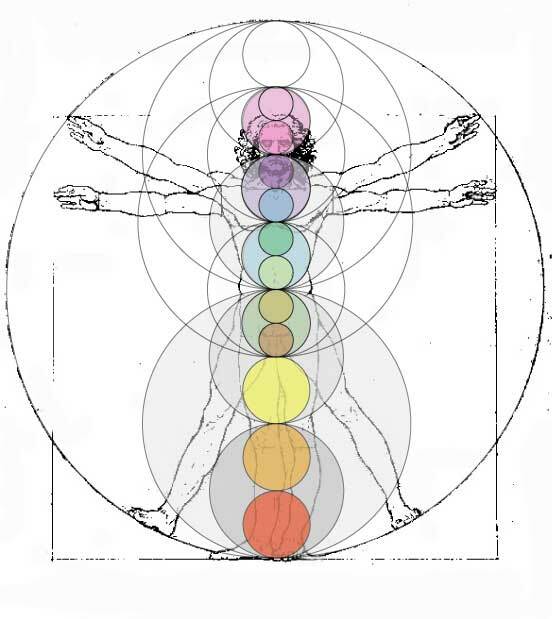 And the overall series of higher order fields are equivalent to the undetectable "prana" or "chi" energy fields used in Chinese tai chi chuan and chi gong/acupuncture, as well as aryavedic medicine and vipassana yoga healing techniques. Thus everything is interconnected at the level of zero-point consciousness, as well as (on the level of information) through inter-field resonance. Therefore, right from the primal beginning, everything (including spacetime itself) is electrodynamic in fundamental nature, and all the laws of electricity, harmony, resonance, capacitance, resistance, inductance, etc, as well as thermodynamics (on the metric physical material levels) universally underlie all the laws of nature. That is the true meaning of the phrase "mind over matter" and explains all placebo effects, blind sight, phantom limb, near death experience (NDE), out of body experiences (OOBE), deja vu, and many other observed psychic powers and phenomena's -- that are unsatisfactorily explained, or entirely unexplained by conventional reductive science. It's these fundamental laws of cycles, rooted in original spin (pun intended;-) that are also the basis of all mathematically described quantum dynamics, and the origin of all cosmic matter-energy fields and their forms and effects, that are postulated in superstring/M theories, and other, as yet unfalsifiable multidimensional hyperspace (ether) field, plasma field, quantum field, holographic paradigm, micro-particle theories, etc. As presented here, the ABC model apparently synthesizes all these scientific theories along with all philosophies (that are proven to be true) with "religion" or the re-tying, re-joining or yoking of our individual consciousness with the all wise, all knowing, all present God, deific principle, or cosmic consciousness that initiates each cycle of cosmic life. In other words, the cosmos and God are one relatively eternal being, and we each, as a microcosm, are the mirrors of the macrocosm, and destined (as it is) to be reborn again and again until the lesson is learned, and we return to the source. Thus our conscious souls (the surrounding triune monadic fields constituting our higher self) or who/what we are, remain forever a part of the cosmic primal field of consciousness during this cycle of a day in its life.